Karst is characterized particularly by special landforms and sub- surface drainage. The various actions of water result in numerous variations of surface and sub-surface karst forms. They also bring about distinctive geologic-morphologic forms, and more striking- ly, specific flora and fauna. 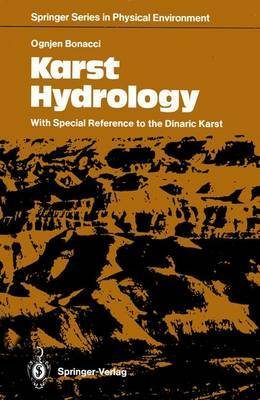 The scientific discipline of hydrology, although a long-established science, cannot easily be applied to karst regions with their very complex drainage system. A special approach is therefore necessary to understand and predict water circulation in these areas. This is the viewpoint we must adopt if hydrology is to solve the complex problems of karst phenomena. This book can be seen as the appeal of a hydrologist to experts from different scientific dis- ciplines (geology, hydrology, geomorphology, geography, geo- physics, meteorology, ecology, civil engineering, forestry, agricul- ture, etc.) to collaborate towards a better understanding of karst areas. Evidently, karst phenomena have not been sufficiently and carefully studied worldwide. It is equally true that the first theories on water circulation in karst were developed according to ex- periences in the Dinaric karst. This can easily be explained. In- habitants in those areas had no place to which to escape, as was the case in other countries.